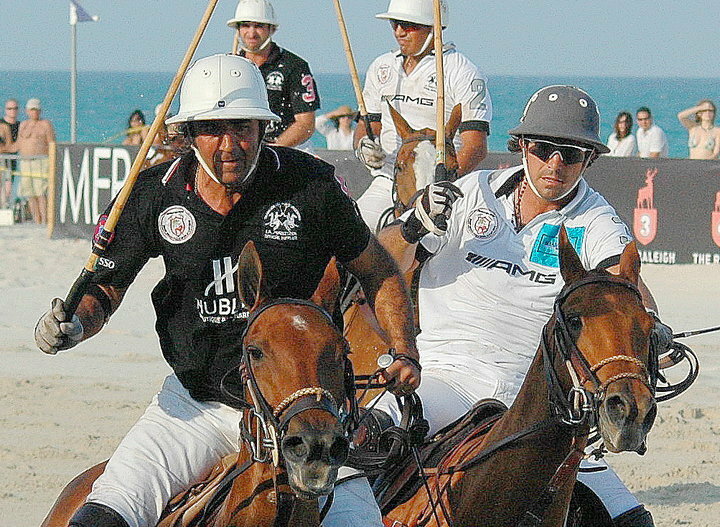 Matias Magrini and Nacho Figueras in a ride-off in Miami Beach. The International Beach Polo Association has been created to organize current beach polo events, aid in the development of future venues and to create a road map for the organization, development and promotion of the game. Beach polo was first played in Dubai in the united Arab Emirates. The following year the game took to the beaches of Miami and continued to grow in popularity, showing up in Belguim, England, Wales, Chile, Ireland, Ureguay and a host of other countries. The growing number of worldwide beach polo events have aided in the exposing the sport of polo to a new audience in a fun and exciting fashion. Beach polo is played in an area about one-tenth the size of the field game, with varying surfaces of sand. Because of the reduction in playing area, the beach polo events are spectator friendly. The recommended playing area is 100 yards long and 50 yards wide. The playing area is enclosed by sideboards measuring between 4.5 to 5 feet in height to keep the 4.5″ leather ball in play. A growing new audience has the ability to combine a day at polo with a day on some of the most beautiful beaches in the world.